During his 2015 State of the Union Address, President Obama unveiled America’s College Promise. If passed, this proposal could make two years of community college free for responsible students around the country. 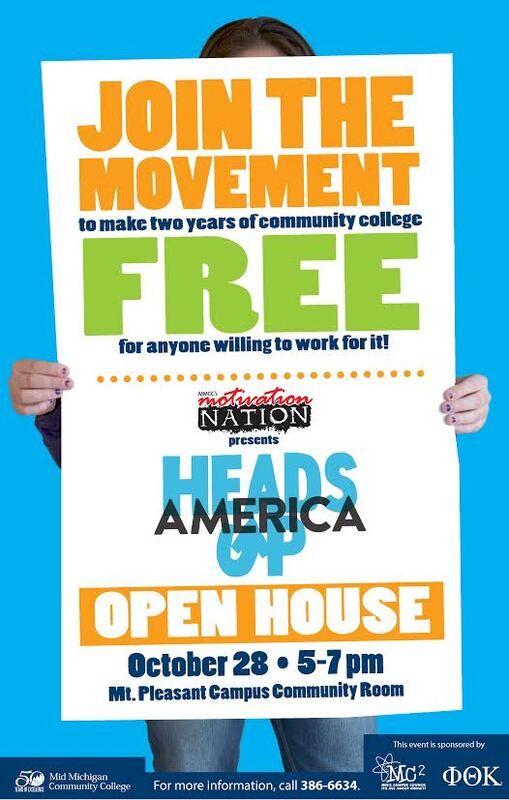 The Heads Up initiative – everyone working together to create a culture that celebrates community college – is a national campaign for the America’s Promise movement. As part of its annual honors project, the Mid Michigan Community College (MMCC) chapter of Phi Theta Kappa – the national student honor society for two-year colleges – is exploring the details of the proposal, investigating the intricacies of college costs, and looking for input from area leaders. The launch of the Heads Up national campaign is the week of Oct. 26. In conjunction with the official unveiling, the Phi Theta Kappa students are hosting a Heads Up event on Wednesday, Oct. 28, from 5 – 7 p.m. in the Community Room on MMCC’s Mt. Pleasant Campus. Interested community members are invited to attend, learn and discuss. The event will begin with a short presentation about the Heads Up initiative and then host a panel discussion with local community and political leaders on the difference that free community college access could make in our state.